Accessories A car's paint must provide years of beauty in an environment containing harmful substances such as acid rain, fallout, dust, dirt, tree sap, and animal droppings just to name a few. Using a car cover not only protects your car's exterior, but it also protects your interior from harmful UV rays. 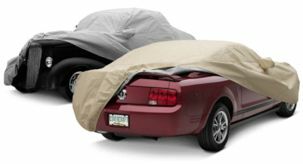 A car cover from CoveritCanada will help product your investment for years to come. As fellow Canadians, we personally know about the effects our harsh weather can do to your vehicle. We can provide you with the right advice to ensure that you vehicle is protected no matter what environment you are in. We provide you with an out-the-door price on all of our products. No hidden duties and brokerage charges when you receive your product. Furthermore, shipping on all of our car car products are a flat rate of $13.99. What goes best with clean shiny wheels? Tires that look brand new. Nothing else helps your ride look its best more than clean wheels and tires, so use Beyond Black tire dressing. It’s got a no sling, no gel formula. No thick, glossy look here. Beyond Black puts that straight-off-the-showroom-floor shine on your tires. It even helps extend their life and protect them from UV rays. What could be better? Oh yeah – it lasts for weeks. Get Beyond Black and get the look of brand new tires. For best results with Beyond Black® Tire Pro, first use Beyond Steel Wheel Cleaner. Cleaning the tires first gives Beyond Black the ability to create a stronger bond to the tires and offers a longer lasting shine. Plus, Beyond Black isn’t just for tires – it also works great on vinyl tops and its powerful UV protection adds years to their life. You can't control the weather, but you can control how you choose to protect your car, truck, or other vehicle. It is our goal to provide you, the Canadian customer, excellent service in finding you the right protection for your make, model, and needs. We carry a variety of premium semi-custom, custom and assembled vehicle covers, floor mats, dash mats, front-end covers, cleaning products, and more. Buying from Canada means you can skip the potential brokerage or duty fees you would otherwise experience from shopping in the United States, and every order is shipped from here in Canada.